Second baseman Bill Regan was a Forbes Field peanut vendor made good. He played six seasons and 641 games in the big leagues and almost the same number of games during six minor-league seasons, but he arrived in professional baseball through something other than a typical progression. He played one year of sandlot ball and one year with an industrial team, and that was it. Regan was born in Pittsburgh on January 23, 1899, and lived in the family home in that city’s Oakland neighborhood - “within a stone’s throw of Forbes Field.”1 After his later marriage to Lillian Haenel in 1925, the couple moved to the Brookline section of the city. Regan’s father, John, was a wholesale baker. His mother, Isabelle, was from Kentucky, born to a father from Scotland and a mother from Canada. John Regan died when Bill was quite young; the 1920 census shows Isabelle as head of the family, living with four children, her sister-in-law, and listing her work as “housekeeper with boarders.” Eldest son John worked as a sign painter and next-eldest James drove a milk wagon. Bill was the fourth child in the family, born after his sister Margaret. Bill attended the 5th Avenue School through the eighth grade, and then presumably began to work. But when the World War broke out, he enlisted in the artillery, trained at Fort Devens and Camp Taylor, and was sent overseas as a replacement in 103rd Artillery of the 26th Division. The armistice was signed before he had been called to the front, so he saw no direct combat. He did apparently arrive in time to see some “fireworks” from the rear during the St. Mihiel offensive and wrote home that every day was the Fourth of July. After returning home, he began to play semipro ball in 1919 as a pitcher for the Pittsburgh Semi-Pros and the Beltzhoover club. He reportedly had some control problems and it was as an infielder that he played in 1920 for the Mansfield Sheet and Tin Plate team in Mansfield, Ohio. One of his teammates was a brother of Otto Jordan, the former major leaguer who was at the time managing Kitchener in the Michigan-Ontario League. Regan signed with Kitchener and one fortunate base hit – a pinch-hit bases-loaded triple – may have secured his stay. During his second year with Kitchener, 1922, he was loaned out for three weeks to Bridgeport in the Eastern League. In 1923 and 1924, he played for Flint, also in the Michigan-Ontario League, known as the Mint League. He was right-handed and is listed at 5-foot-10 and 155 to 160 pounds. Regan’s first team in Organized Baseball was the 1925 Columbus Senators (American Association). He played in 149 games, hit 12 homers, and batted .297. In 1925, he married Lillian Haenel. He began the next year with Columbus and appeared in 34 games. Through May 20, 1926, he was batting .344. The Boston Red Sox acted on May 25, sending infielders Emmett McCann and Jimmy Geygan to Columbus for Regan. His first two appearances in the majors were on June 2 and June 3, in fruitless pinch-hitting roles for manager Lee Fohl. His first start came on June 8 and he was 0-for-4 with a walk. Regan’s first base hit was on June 9 and he singled, doubled, and drew a walk in four plate appearances, scoring two runs. He singled and doubled on June 10, too, and again scored two runs. After missing the first six weeks of the major-league season, when he got the opportunity to play, he beat out Ramon Herrera for the second-base slot and held it for the next few years. In his rookie season, Regan played in 108 games, homered four times, and drove in 36 runs, batting .263. After being away from the game for ten years, Bill Carrigan took the reins as Red Sox manager again in 1927. Regan was his second baseman, appearing in 129 games (he suffered a case of boils early on and then missed a couple of weeks in May when his finger was squashed in a taxi door), improving his batting average to .274 and driving in 66 runs. Only Ira Flagstead’s 69 RBIs ranked above him on the team. The Red Sox, though, lost their first six games, were 2-11 after 13 games, and finished with a 51-103 record, deep in eighth place. Bad as that was, it was five more wins than the year before (46-107). He hit .288 in 1929, but was “out of condition” and missed most of July; he played in just 104 games, though productively. He knocked in 54. The Red Sox came in last yet again. 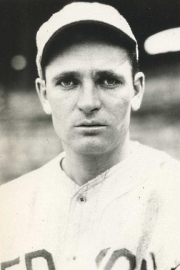 After three years with Carrigan at the helm, Heinie Wagner took over as manager in 1930. The team fared no better, going 52-102 and still stuck in last place. Regan played another solid season, hitting .266 in 134 games with 53 RBIs (third on the Red Sox). The Sox brought in Shano Collins to manage for the 1931 season and, as the train passed through Albany on its way south for spring training, Collins told reporters on board that Regan had been waived to the Pittsburgh Pirates. “It is just another house-cleaning move which marks Shano as a manager of courage,” wrote the Herald. “He says he wants younger and faster performers for his infield, the part of the team which he considers below par and where strength must be added if the Hose are to get out of the cellar.”7 Regan was expected to play a utility infielder role with the Pirates, playing baseball in his native Pittsburgh. He played in 28 games over the first couple of months of the season, but only hit for a .202 batting average with ten runs batted in. His friends did hold a “day” for him at Forbes Field in the first part of May. Regan appeared in his last major-league game on June 14 – though two of those RBIs came on walkoff hits which won games on both June 2 (ninth inning) and June 4 (13th inning). He’d hit .267 in 641 major-league games. Baltimore had a need at second base and arranged for Regan to be released outright to them on June 16. He played out the remainder of 1931 for the International League Orioles, hitting .321 in 101 games. He hit seven homers that year, then seemingly traded a little average for power and homered 27 times in 1932 in 135 games, hit 35 doubles and eight triples, batting .282 and driving in 86 runs, again for Baltimore. Three of those homers came in the same game, in the April 24 home game. The Montreal Royals acquired him for the 1933 campaign and he split the season playing first for Montreal and then Buffalo (both also in the I.L. ), hitting .261 in 118 games. He started 1934 in Buffalo and was then traded to Toronto in late July for outfielder Ray Fitzgerald, with his average declining ten points to .251 in 101 games. He finished strong, though, his month-plus with the Maple Leafs seen as a comeback.8 His last hurrah was in the Southern Association with Birmingham in 1935, when he played in 57 games, batting .306 at Single A ball. Regan kept his hand in the game after his pro career was over, and was found playing semipro ball for the Cloverland Farms team in Baltimore in May 1936. He took up work as a groundskeeper and gardener working in parks and cemeteries and was “separated without dependents” when he enlisted in the Army at age 43 in September 1942. Regan thus served in both World War I and II. After the war, he put in 20 years as a policeman for Allegheny County, living in the city of Pittsburgh. Regan died of anaplastic adenocarcinoma in Pittsburgh on June 11, 1968, leaving behind a second spouse, the former Maxine Molitar. He is buried in that city’s Calvary Cemetery. In addition to the sources noted in this biography, the author also accessed Regan’s player file and player questionnaire from the National Baseball Hall of Fame, the Baseball Necrology, the Encyclopedia of Minor League Baseball, Retrosheet.org, and Baseball-Reference.com. 3 The Sporting News, May 21, 1931. 4 Boston Herald, August 4, 1926. 5 Boston Globe, August 23, 1926. 6 New York Times, June 17, 1928. 7 Boston Herald, February 20, 1931. 8 The Sporting News, September 6, 1934.